Simplicity ReleezMe takes personal storage to the next level. It’s a new and innovative way to manage your personal storage – remotely. Get the most from your Simplicity lockers by choosing ReleezMe software. ReleezMe offers secure access via the Microsoft Azure Software as a Service (SaaS) cloud platform. It’s also available as an on-premise edition to meet your specific IT policy. Set up business rules tailored to dynamic working environments. Integrate with your access control or HR system to automate enrolment. Monitor and generate reports on usage. ReleezMe software offers several different user roles including Administrator and Facility Manager, which are authorised to use different elements of the software. At the most basic level Service Desk users simply have viewing permissions. Storage is structured in the following way. Firstly, by location for example, Amsterdam or London. Then by section, for example floor or department. Finally, storage is structured by locker bank, for example you could have a bank for visitors or employees (a locker bank is defined as a cluster of lockers controlled by one terminal). The way your company’s storage is set-up is represented graphically in the software making it easy to navigate. Public lockers are accessible to anyone with a valid badge, including visitors. Static lockers allocated using software, often used for team lockers. Dynamic (keep) lockers used flexibly and dynamically. Toggle lockers are similar to Dynamic (keep) but usage has to be confirmed by badge after the locker is closed (to avoid locking the badge inside the locker). Different locker banks can have different lock modes. So, for example, you could have Public visitor lockers in your first-floor reception and Static lockers in the office for your Human Resources department. ReleezMe makes managing your storage easy. Edit help desk operators, plan and send email and push notifications, view your event log and produce reports. Email and push notifications can be served to individuals or groups of users. As well as making service announcements, users can be encouraged to release their locker – ensuring they continue to be used dynamically. 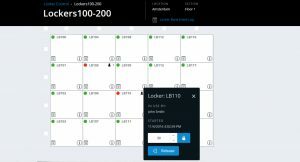 Details of each locker event including the dates and time, locker and user involved are logged in the system. Examples of an event include the opening or assignment of a locker. Depending on your company’s IT policy, event data can be retained for up to 90 days. 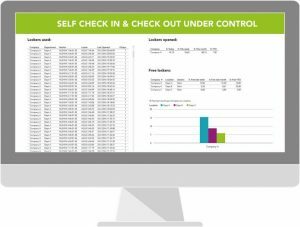 ReleezMe gives you the ability to generate several different Excel reports including, Service Events, Locker Bank Occupancy and Used and not opened lockers. These reports help to enable your facilities team to monitor storage usage and make decisions about how it should be assigned in the future. The ReleezMe mobile app works alongside your organisation’s existing building access card. All IOS/Android users can download this free app with minimal administration support. The app then makes the user’s smartphone act as their own personal terminal, just like Apple Pay. The above information gives an indication of what ReleezMe is capable of but is far from comprehensive. For further information and to find out how ReleezMe locker software could work for you please speak to our team. Read Dave Garey’s experiences with ReleezMe in our Xerox case study.